* 2017 KBB.com 10 Best Sedans Under $25,000 * 2017 KBB.com 10 Most Awarded Brands * 2017 KBB.com Brand Image Awards Call Egolf Brevard at 828-884-4151. You make the drive, well make the deal and youll feel like family! With solid power, excellent fuel economy, distinctive styling and a wide array of tech features, the 2017 Ford Fusion is a great choice for a midsize sedan. The Ford Fusion receives a plethora of upgrades for 2017. Among them are the new Sync 3 infotainment system, the ultra-luxe Platinum trim level, a powerful engine in the new V6 Sport model and refreshed front-end styling. Fuel-efficient turbocharged engines; sharp handling; quiet cabin; advanced technology and safety features; improved touchscreen interface; available all-wheel drive. When the current Fusion came out back in 2013, it was considerably better than the car it replaced and became an immediate hit with consumers. The handsome Aston Martin-esque grille, attractive interior and multiple powertrain choices ensured there was something for everybody. It's been five years since it debuted, but the current-generation Fusion still looks fresh. But inertia is the death knell in this ultra-competitive segment, so the 2017 Ford Fusion has a few tricks up its sleeve to keep shopper interest high. Chief among these is the Sync 3 infotainment system, which replaces the generally unloved MyFord Touch interface. Sync 3 is faster and easier to use thanks to its large, smartphone-style virtual buttons and menus. Or, if old-school horsepower is more of an interest, Ford's got you covered there, too, with the new Fusion Sport V6 trim. It features a turbocharged 2.7-liter V6 that cranks out 325 horsepower and 350 pound-feet of torque, which makes it the definitive hot rod of its class. All 2017 Fusions get a redesigned front fascia with new headlights, a rotary transmission gear selector and push-button ignition, and there are some new options such as LED headlights and an enhanced automated parking system that can now perform parallel and perpendicular parking. There's also a new luxurious Platinum trim that includes nearly every option available and further adds unique features like quilted leather seat inserts and a power-adjustable steering wheel. When we factor in these updates along with the Fusion's existing qualities, the overall appeal of this midsize sedan becomes quite obvious. The Fusion is one of many great choices this year, though. We highly recommend the Honda Accord, for example, which recently received a rejuvenation of its own. If fuel efficiency is important to you, the new Kia Optima (like its Hyundai Sonata sibling) offers an engine that tops the Fusion's most eco-friendly EPA estimates. There's also the new Chevrolet Malibu, the stylish and sporty Mazda 6 and the tried-and-true Toyota Camry to consider. Still, the 2017 Ford Fusion is a wonderfully well-rounded sedan that should be at the top of your list if you want a cool family hauler. 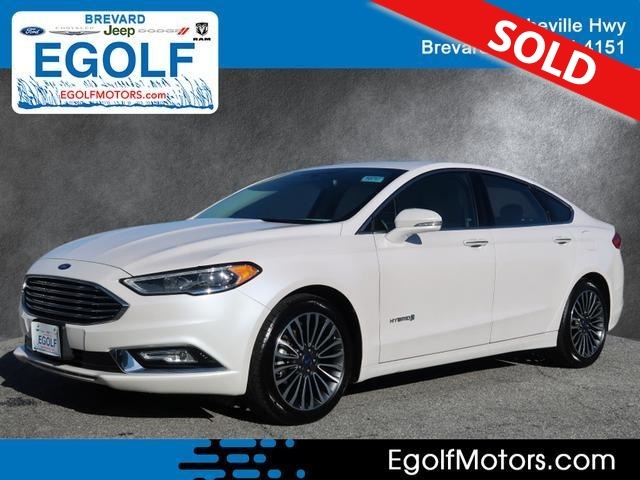 Moving up to the Fusion SE gets you 17-inch wheels, LED daytime running lights, exterior keypad entry, an eight-way power driver seat (with power lumbar), a six-way power passenger seat, rear heat ducts, a rear center fold-down armrest and a six-speaker sound system with satellite radio. Optional for the S and SE is the Appearance package, which features 18-inch alloy wheels, foglights, a rear spoiler, a leather-wrapped steering wheel and special cloth upholstery. The SE is also available with the Luxury package (Equipment Group 202A), which adds the turbocharged 1.5-liter engine, LED headlights and foglights, keyless ignition and entry, remote ignition, an auto-dimming rearview mirror and driver-side mirror, heated mirrors, leather upholstery, driver memory settings and heated front seats. The Fusion Titanium comes standard with the turbocharged 2.0-liter engine, 18-inch wheels, upgraded taillights, a rear spoiler, ambient interior lighting, sport front seats, eight-way power adjustment for the passenger seat, a premium 12-speaker Sony sound system, HD radio and all of the SE's optional features mentioned above. The Fusion SE (with the Technology package selected) and Titanium can also be equipped with a navigation system, an automated parking system for parallel and perpendicular parking, and adaptive cruise control with frontal collision warning. For the SE and Titanium, Ford additionally offers the Driver Assist package, which includes automatic high beam control, automatic wipers, a 110-volt power outlet, a heated steering wheel, blind-spot monitoring, rear cross-traffic alerts and a lane departure warning and lane-keeping assist system. A sunroof is optional for both the SE and Titanium, and the Titanium can be had with 19-inch wheels and ventilated front seats. The luxe Platinum trim includes all of the above features in addition to a unique grille insert, upgraded leather trim and a power-adjustable steering wheel. The range-topping V6 Sport (late availability) starts with features from the SE with Luxury package and adds a turbocharged V6 engine, a different grille, 19-inch wheels, quad exhaust tips, a rear spoiler, adjustable suspension dampers, a nine-speaker audio system and leather and simulated suede upholstery. The V6 Sport Upgrade package (Equipment Group 401A) includes the features from the Titanium trim. It is also available with the Driver Assist package and the stand-alone options listed above. The Fusion S and SE come standard with a 2.5-liter four-cylinder engine that's rated at 175 hp and 175 lb-ft of torque. Power is sent to the front wheels through a six-speed automatic transmission. EPA-estimated fuel economy stands at 26 mpg combined (22 city/34 highway), which is average for this class. For the SE, there are two additional engine options. The first is a turbocharged 1.5-liter four-cylinder that produces 181 hp and 185 lb-ft of torque. It's paired with a six-speed automatic and includes paddle shifters and automatic engine stop-start to help save fuel at stoplights. Fuel economy stands at 29 mpg combined (25/37). Also available on the SE (and standard on the Titanium and Platinum) is the turbocharged 2.0-liter four-cylinder with 240 hp and 270 lb-ft of torque. Front-wheel drive and a six-speed automatic is standard, and all-wheel drive is optional. Front-wheel-drive versions earn 26 mpg combined (22/33), while AWD brings the rating down slightly to 25 mpg combined (22/31). In Edmunds performance testing, a Fusion Titanium with this engine and AWD accelerated from zero to 60 mph in 6.9 seconds, a little slower than average for a midsize sedan with an upgraded engine. Unique to the V6 Sport is a turbocharged 2.7-liter V6 engine that develops 325 hp and 350 lb-ft of torque. All-wheel drive and the six-speed transmission are standard. EPA fuel economy estimates were not available at the time of publishing. The 2017 Ford Fusion comes standard with antilock disc brakes, traction and stability control, front-seat side airbags, front knee airbags and side curtain airbags. The Ford Sync system includes an emergency crash-notification feature that automatically dials 911 when paired with a compatible cell phone. Also standard is Ford's MyKey, which can be used to set certain parameters for secondary drivers such as teens or valets. Optional equipment includes blind-spot monitoring, rear cross-traffic alerts, driver drowsiness detection, a combined lane-departure warning and intervention system, a frontal collision warning system with brake priming, and inflatable rear seatbelts. In Edmunds brake testing, a Fusion Titanium stopped from 60 mph in 123 feet, an average distance for this class of car. The government awarded the Fusion five out of five stars for overall crash protection, with five stars for total frontal protection and four stars for total side-impact protection. The Insurance Institute for Highway Safety gave the Fusion the highest possible rating of "Good" in its moderate-overlap frontal-offset, side-impact and roof strength crash tests. In the small-overlap frontal-offset test, the Fusion earned a second-best rating of "Acceptable." Its head restraints and seatbelts earned a "Good" rating for their whiplash protection in rear impacts. Cabin design and execution of the 2017 Ford Fusion echoes that of its exterior. There's a cool and urbane style to the seats and dash, a tone set largely by the high-quality finishes and, of course, the lack of center stack buttons when the optional Sync 3 touchscreen system is specified. The emphasis is on having large, nicely textured surfaces and removing extraneous clutter, and it mostly works. The Sync 3 system, available on SE models with the Technology package and above, is considerably better than the MyFord Touch interface it replaces. Sync 3 is more responsive to inputs, and its large virtual buttons are easier to press accurately than the old system's tiny boxes and bars. The optional navigation system offers pinch-to-zoom and swiping motions, effectively mimicking a smartphone interface. The driver seat is easy to adjust into a just-right position and provides good sight lines out the front and sides of the car. It's harder to see through the sloping rear window, so it's helpful that a rearview camera comes standard. The roof's rearward slope also cuts into rear seat headroom, though not so much as to make most average-height rear passengers uncomfortable. The front seats also are mounted high enough off the floor that those in the rear can at least partially fit their feet under the front seats. Trunk space, at 16 cubic feet, is about average for the midsize sedan segment. There's a comfortable and assuring tautness to the way every Fusion rides, and the steering is accurate and nimble-feeling. It all comes together to make the driver immediately feel comfortable with its responses. Highway cruising is commendably quiet and composed, and the well-engineered seats make the 2017 Ford Fusion a good companion for all-day interstate hauls. Although it's fully competitive with similarly sized engines from Chevrolet and Honda, the Fusion's base 2.5-liter engine isn't very inspiring. Perhaps it's because the optional turbocharged engines are markedly more entertaining. In spite of its small size, the 1.5-liter turbocharged four is smooth and eager and provides an appealing blend of fuel efficiency and performance. That said, the turbocharged 2.0-liter four noticeably ups the performance aspect and pairs well with the Fusion's optional all-wheel-drive system. We haven't tested the V6 Sport yet, but we have driven an F-150 with this engine. We love the way it rockets the big pickup away from a stoplight, and we imagine it's even more enthusiastic in the smaller, lighter Fusion.